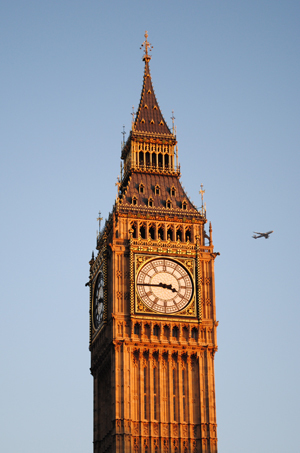 The tower at the northern end of the Houses of Parliament is known to many simply as Big Ben – what isn’t often realised is that (as was pointed out in this earlier article) Big Ben actually refers to a bell inside the tower and not the tower itself. The tower, rather, has the rather plain moniker of The Clock Tower. But in honor of the Queen’s Diamond Jubilee, that’s all about to change. News broke this week that politicians have decided to rename the tower the Elizabeth Tower in honor of Queen Elizabeth II. The move does have precedent – the great southern tower which stands over the Sovereign’s Entrance to the House of Lords was once known as the King’s Tower but was renamed the Victoria Tower in honor of Queen Victoria’s Diamond Jubilee in 1897 (Queen Victoria is the only other British monarch to have celebrated a Diamond Jubilee). The 96 metre high tower, part of the Houses of Parliament (officially known as the Palace of Westminster), is not the first clock tower to stand on the site of the palace. The first, located on the north side of New Palace Yard, was built in 1288-90 in the reign of King Edward I and contained a bell and clock. It was replaced in 1367 with a tower that featured the first public chiming clock in England. This second tower was demolished in 1707 after falling into disrepair and replaced with a sundial. Following a fire which destroyed much of the Palace of Westminster in 1834, architect Sir Charles Barry was selected to design new buildings to house Parliament but interestingly his initial designs didn’t include a clock tower – this was added to the plans in 1836. Construction of the new Clock Tower, which was built from the inside out and clad in Yorkshire Anston stone and Cornish granite, began in September 1843 but wasn’t completed until 1859 following considerable delays. The ‘lantern’ at the top is known as the ‘Ayrton Light’, named for Acton Smee Ayrton, an MP and the First Commissioner of Works in the 1870s. Not installed until 1885, it is lit up when either House is sitting at night. The clock was constructed by Edward John Dent and his stepson Frederick to the designs of Edmund Beckett Denison. It included a “revolutionary mechanism” known as the ‘Grimthorpe Escapement’ (Denison was later created Baron Grimthorpe), which helped ensure the clock’s accuracy despite external factors like wind pressure on the clock’s hands and which was adopted in many subsequent clocks. The design of the dials were a collaboration between Barry and Augustus Welby Pugin. The clock was installed in April 1859 but the cast-iron hands were too heavy and had to be replaced with copper ones. It began keeping time on 31st May, 1859. It’s worth noting that the tower tilts at 0.26 degrees to the north-west but experts say this is apparently not going to be a major structural problem for 10,000 years. For more on the Clock Tower including a terrific virtual tour, see www.parliament.uk/bigben. It is possible to tour the Houses of Parliament – including climbing the 334 steps to the top of the Clock Tower – but this is only open to UK residents (and they book up months in advance). For more on the tours, see www.parliament.uk/visiting/visiting-and-tours/ukvisitors/bigben/.